Effective control of toxic emissions from fertilizer plants, has been demonstrated in the South American countries of Colombia and Venezuela. A jointly operated process plant in Monomeros Colombo Venezolanos, produces caprolactam for the textile industry and various chemical fertilizers for agricultural use. Agricultural plant capabilities were recently increased with the addition of process units to improve the production and quality of fertilizers. The new process equipment includes a stirred-tank reactor that produces nitrophosphate solution from a mixture of phosphoric acid, nitric acid and anhydrous liquid ammonia. The unit can neutralize 10 metric tons per hour of 100 percent nitric acid and 6 metric tons per hour of phosphoric acid. Neutralized solutions are pumped to the main process section for further conversion into NPK fertilizers. Two pipe cross reactors, originally designed by the Tennessee Valley Authority produce monoammonium phosphate (MAP) from phosphoric acid, sulfuric acid and ammonia. The reactors’ capabilities range from daily capacities of 140 to 240 metric tons. The ability to produce monoammonium phosphate has many economical advantages. Unfortunately, it has also resulted in an unexpected amount of NPK dust. After considering a variety of pollution control devices it was decided to scrub the acids by circulating phosphoric acid in a wet scrubbing system designed by the Clean Air Group, LLC. 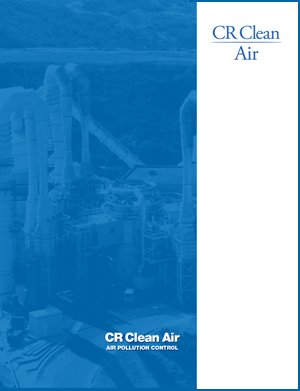 The Clean Air Group supplied a venturi scrubber and a packed cyclone separator. Engineers of Monomeros and Clean Air worked together on the potential problems of the installation including the difficulty of handling phosphoric acid in a hot climate, and the clogging of the cyclone packing material by silicon compounds. The venturi scrubber atomizes liquid which captures and removes fine dust particles. The scrubbing process starts with a high velocity gas stream atomizing a liquid stream. This high atomization and extreme turbulence removes even micron or sub-micron dust particles. The atomized liquid and gas from the venturi section discharge into a cyclonic separator. The separator is 72 in. in diameter by 24 ft. high and packed with a polypropylene “Spiral-Pac®” material. The gas in the separator spins rapidly, and whirls the liquid particles to the outside of the vessel. The liquid condenses, runs down the wall, is collected and returned for recycling. Gases exit from a port in the top of the vessel. To assure complete ammonia removal, a finial packed tower section is included in the design. This section uses CR “Spiral-Pac®” plastic packing to absorb ammonia in the re-circulated solution. Ammonia, Dust Removal Efficiencies High: The scrubber-separator was designed to maintain an ammonia absorption rate of 95 percent of 110 kilograms/hour lost from the reactor. Fertilizer dust emissions were estimated to be about 20 kilograms/hour and were to be controlled by limiting the discharge to a maximum of 0.20 grains/SCF (99.3% efficiency). In the months since its installation, the equipment has successfully processed 12,000 ACFM off-gas: 0.8 percent by volume of ammonia; and 28.0 grain/SCF dust; and has operated at 80aC. Clogging is avoided by holding solids concentration at 40 percent in a medium with a pH of 3.0. As a further anti-clogging measure and to provide abrasion protection for the pumps, a special overflow tank below the scrubber bottom is decanted and the solids removed. Fresh phosphoric acid is added as makeup while part of the circulating liquid is fed into the neutralizing reactor.